Draft: 2000, St. Louis Cardinals, 4th rd. He and his wife, Wanda, make their home in Jupiter, Fla., with their sons, Yanuell Benjamin (10/20/08) and Daniel (2/6/16), and daughter, Adrianna (7/4/10)...Graduated from Escuela Superior Maestro Ladi in Vega Alta, Puerto Rico in 2000...Yadier (2006, 2011) and his two older brothers, Bengie (2002 Angels) and Jose (2009 Yankees), are the only trio of brothers to have all won a World Series ring...Played American Legion ball in 2000 for Post #48...After the 2004 season teamed with Rick Ankiel during Puerto Rican Winter League play with Carolina and batted .297 (10th in league)…played for Carolina in 2006, winning Puerto Rican Championship...Changed from uniform #41 to #4 prior to 2006 season...Named St. Louis BBWAA Baseball Man of the Year for 2012 and co-winner in 2013 with Matt Carpenter and Adam Wainwright...Named the 2015 Darryl Kile award winner by vote of his teammates. Named to his 9th All-Star Game as an injury replacement for Buster Posey, most of any player on the National League squad...Was 0-for-1 in the game as a pinch-hitter flying out to the centerfield track...His ninth All-Star selection with the Cardinals tied him with Red Schoendienst, Albert Pujols and Bob Gibson among the franchise leaders...Rawlings Gold Glove Award winner at catcher, the ninth overall in his career...In November 2018 with teammate John Brebbia, played on the MLB roster against all-stars from Nippon Professional Baseball in the 2018 Japan All-Star Series, a seven-day series of games in the cities of Tokyo, Hiroshima, and Nagoya in Japan...The trip to Japan marked the 37th time overall Major Leaguers toured Japan for exhibition games in a series dating back to 1908...At age 36, Molina, was the oldest player on the US roster, and hit .500 (8-16) with a home run and double in four games...Winner of the prestigious Roberto Clemente Award, annually given by Major League Baseball to the player "who best represents the game of baseball through positive contributions on and off the field, including sportsmanship and community involvement. Joined Carlos Beltran (2013), Albert Pujols (2008), Ozzie Smith (1995) and Lou Brock (1975) as previous Cardinals winners...Missed 26 games (St. Louis was 13-13) due to pelvic injury with traumatic hematoma that he suffered after taking foul ball off the bat of Kris Bryant vs. CHI (5/5) on a 102 MPH pitch from Jordan Hicks...Also sat out six games (STL 3-3) in September (9/7-12) while on the active roster with a sore left hamstring...Has played in 1,870 career games with the Cardinals, ranking 4th all-time in Cardinals history. Surpassed Albert Pujols (1,749) on 4/1 at NYM and Enos Slaughter (1,751) on 4/3 at MIL during the first week of the season. Ranks 11th all-time among Puerto Rican-born players...Hit 20 home runs, his 2nd highest single-season total (22 in 2012) and joined Ted Simmons (1977, 79) as the only two St. Louis catchers with multiple 20 HR seasons. Became the 7th catcher in MLB history to hit 20 or more home runs at age 35 or older since A.J. Pierzynski (27, 2012, CWS)...His 146th career HR on 9/25 vs. MIL tied him with Enos Slaughter for 13th in Cardinals history...Upon hitting his 145th career home run on 9/22 vs. SF, became the all-time home run leader in the Molina family (Bengie 144, José 39)...Hit 17 of his 20 home runs on the road, ranking T-4th in the NL in road home runs - the most road homers hit by a Cardinals catcher in a single season...St. Louis was 68-53 (.562) in his games played; 20-21 (.488) when injured/off in 2018...Set a new MLB record for a catcher 35-years or older starting 27 straight games (7-22-8/19). Most by a Cardinals catcher since Ted Simmons with 29 straight in 1979. Sat out 8/20 at LAD after 27 straight starts. Started next day and hit GW-HR (#16)...From 7/12 through the end of the season, did not commit an error (519.1 innings, 509 TC), while collecting an MLB-high seven double plays, catching 519.1 innings and starting at catcher in an MLB-leading 61 (of-61) games...Led MLB catchers with 74 RBI and tied for the lead with 118 hits (Realmuto, MIA); T2nd with 20 HR (Zunino, SEA)...Finished season ranking 10th in MLB history in most starts at catcher (1,773). His 1,836 career games caught for the Cardinals are the most by any catcher with a single team, surpassing Gabby Hartnett (CHI, 1,756) on June 18, 2018...Scored a run in 45 games (Cardinals were 35-10)...Hit his 4th career Opening Day home run at NYM (3/29), tying Albert Pujols for most Opening Day home runs in Cardinals history...Swiped career stolen base #57 at MIL (4/3), tops all-time among Cardinals catchers in franchise history...Hit his third home run of 2018 at MIL (4/4), the most ever by a Cardinals catcher in the team's first six games...his 3 HR in first 8 games tied his mark from 2014. Lou Brock hit club-record 6 HR in the team's first 7 games in 1967...Sat out 4/11 game vs. MIL after dropping appeal of onegame suspension stemming from an altercation with Arizona manager Torey Lovullo on April 8...Became the all-time leader in RBI at Busch Stadium III with a two-RBI double vs. Cincinnati (4/20) moving him past Albert Pujols (356)...On 4/21 vs. Cincinnati, recorded hits 1,750th career hit (1st inn. single off Homer Bailey) and his 800th career RBI (7th inn. GW solo home run off Jared Hughes)...Collected his 7th career walk-off RBI (6th career walk-off hit) on 5/1 vs. CWS, with an RBI single to score Marcell Ozuna...Matched his career single-game high (18th time) with 4 hits at CHI (7/19)...Recorded 18 RBI vs. the Reds in 2018, most of any player in MLB, and his most vs. a team in a single season (previous high was 16 vs. CHI, 2013)...Has 60 career RBI at Great American Ball Park, most by any visiting player...Surpassed Lance Berkman (58) and Albert Pujols (57) in 2018 for the mark...Collected his 500th career extra base hit at KC (8/11), tying Red Schoendienst for 7th place all-time in Cardinals doubles (352)...Passed Lance Parrish for 12th all-time in games played with 1,819 on 9/1...Passed Bob Boone for 13th place all-time among catchers with 1,839 career hits on 9/4...Hit 6th career grand slam at WSH 9/5 (w/ 2 strikes & 2 outs)...Is batting .351 (20-57) and slugging .649 with bases loaded since 2015...His six career grand slams ranks T6th in franchise history (Pujols, 1st, 12). Named to his 8th Major League Baseball All-Star Game and hit the game-tying home run for the National League in the 6th inning off Ervin Santana ... Led the Cardinals and all MLB catchers with 82 RBI, the most by a Cardinals catcher to lead the team since Ted Simmons had 95 RBI (91 as catcher) in 1977 ... Led the Cardinals with 137 hits, the fewest amount of hits to lead the team in a non-strike season in franchise history ... Posted the longest hitting streak for the Cardinals in 2017 with 16, doing so on two separate occasions (5/8-27 & 6/8-7/1), tying his career high. Reached base safely in 21 straight games, 5/1-27 ... Ranked 2nd on the Cardinals with nine stolen bases, leading all MLB catchers ... Led all National League catchers with 1,125.2 innings caught. his 10th season with 1,000+ innings caught and also led in games played (133) ... Knocked in 22 runs in September, his single-month high ... Removed from 9/25 game vs. CHI after taking consecutive foul balls to the mask and placed in concussion protocol. Did not play in the final six games of the season ... Played for team Puerto Rico in the World Baseball Classic and was named to the all-WBC team ... Signed a three-year contract extension (2018-20) on 4/2. Led the Cardinals with a .307 batting average (8th NL), 38 doubles (T9th) and 46 multi-hit games (T16th). Led the team in batting for the 4th time in his career (he also led the team for three consecutive seasons from 2011-13)...Led all MLB catchers in batting average, hits (164) and doubles...Paced all MLB catchers with a career-high 1,218.1 innings caught, marking his 9th season with 1,000+ innings caught. Also set career bests and led MLB backstops in games (146), starts (142), total chances (1175), putouts (1113), and fielding pct (.998)...His single-season high 146 games caught were the most by a Cardinals receiver since Ted Simmons caught a team singleseason record 154 games in 1975. Has started 100+ games in 12 straight seasons (2005-present)...Batted .365 (89-244) Post All-Star Break, the 2nd-highest in MLB (Votto, CIN, .408). It was the highest Cardinals Post All-Star Break average since Albert Pujols (.366) in 2008, while his 89 hits were the most since Willie McGee (112) in 1985...Posted team-highs with 13 three-hit games and 46 multi-hit games. Ranked 2nd only to Buster Posey (SF) with 47 multi-hit games among MLB catchers...Struck out once every 9.22 plate appearances, ranking 4th in the National League...Ranked 2nd in MLB with a .365 BA (61-167) in the 7th inning or later (LeMahieu, COL, .366)...Batted .275 (64-233) with two strikes (4th NL)...Had a .341 batting avg. in April, 2nd highest on the team (Diaz, .423) and 8th in the N.L...Caught Jaime Garcia's shutout vs. MIL (4/14), his 107th career, tying A.J. Pierzynski's MLB lead among active players (Elias)...Started one game at first base vs. PHI (5/4), his second career start. Played six innings before finishing at catcher...On 6/15 vs. HOU with Adam Wainwright, passed Bob Gibson and Tim McCarver (197) for the Cardinals all-time lead in games started as batterymates...Became 34th catcher in MLB history with 1,500 hits with single off Milwaukee's Jimmy Nelson in the 4th inning (7/2)...Reached base safely in a career-high 24 straight games (7/8-8/11), batting .379 with a .438 OBP. It was the 2nd-longest on base streak by a Cardinals player in 2016 (Aledmys Diaz, 26) and the longest by a Cardinals catcher since Gene Tenace reached in 35 straight over a two season (1981-82) period...Posted a career-high 16-game hitting streak (7/8-8/2), batting .367 during the stretch, and had three hitting streaks of 10 games or more with two additional 11-game hitting streaks...Doubled in eight straight games (7/24-8/2), tying the MLB modern era record with Derrek Lee (2007). The eight-game streak bested his own seven-game double stretch (6/4-6/12/13); Joe "Ducky" Medwick also had a 7-game stretch (7/5-14/1936)...Hit 300th career double at MIL (8/30), a ground-rule double in the top of the 10th inning in the Cardinals 2-1 victory...Scored in career-best six straight games (8/31-9/7)...Hit 4th career grand slam, coming in the 1st inning at PIT (9/6). His first grand slam since 5/27/12 vs. PHI off Roy Halladay. Was part of a four-hit night, marking his season-high and matching his career high (17th time). The grand slam gave the Cardinals a home run in 25 straight games matching the National League record set by the Padres earlier in the season...Hit walk-off double in the bottom of the 9th inning vs. CIN (9/29) for his 5th career walk-off RBI and 9th GW-RBI (T1st STL) of 2016. Earlier in the game, hit his 8th home run for his 700th career RBI...Batted .371 in September, ranking 5th in the N.L. It was his highest BA in a month since batting .394 in May 2013. His .388 BA in Sept./Oct., ranked 3rd in MLB behind Daniel Murphy (WSH, .393) and Joey Votto (CIN, .389)...Hit safely in 17 of last 18 games (.431, 28-65) to end the season, with the one hitless game, when he was removed after the 4th inning of a 12-5 loss...Batted in the No. 3 slot in the last seven games of the season, hitting .423 (11-26)...Finished season with 1,593 career hits, moving past Bill Freehan into 25th place all-time for career hits among MLB catchers. Selected by players as a National League All-Star, his 7th-straight season selected to the Mid-Summer Classic. Entered the game as catcher in the 6th and caught three innings, collecting a single in his one at-bat…Rewarded with his 8th consecutive Rawlings Gold Glove award and received his 4th Platinum Glove, given to the best defensive player in the National League at any position… Missed the last 13 games of the regular season after suffering a slight ligament tear in his left thumb. Injury occurred on putout at the plate in the bottom of the 8th at CHI on 9/20…His 2.79 catcher's ERA topped all MLB catchers, and was a 1/2 run lower than the next closest (Y. Grandal, LAD 3.35). That ERA was the best since Alan Ashby in 1981 (HOU, 2.33)…Led the National League and finished 2nd in the majors with 1149.2 innings caught (S. Perez, KC 1192.1 IC)…Has started 100+ games in 11 straight seasons (2005-present)…His 131 hits as a catcher ranked 1st in the N.L. (2nd MLB) and his 23 doubles ranked 3rd in N.L…Finished 4th on the team with a .270 batting average and was 5th with 132 hits, his 8th consecutive season with 100+ hits…Finished the season with 39 multi-hit games, 2nd to B. Posey (SF) among MLB catchers…Ended season 3 games shy of Ted Simmons STL record 1439 games caught, having caught a career 1436 games for STL…Passed Tim McCarver for 25th place on MLB's all-time innings caught list on 7/19 when he caught all 18 innings of a 3-1 loss vs. NYM. Currently ranks 21st all-time innings caught at 12,026.2 innings…Collected 28 hits during interleague play, T3rd-most among N.L. players in 2015…Had RBI in 4-straight games 4/15-18, matching the team high…Posted a 9-game hit streak in June (6/13-24, .441); hit .306 during the month which followed his .308 average during May…Had 3 hits including a 3-run, game-winning triple at CWS on 7/22…Collected a team-high 21 August RBI, the most August RBI by a St. Louis catcher since Ted Simmons had 21 in 1980. Seven of his 16 multi-RBI games came in August…Game-winning RBI triple on 8/12 vs. PIT was his 2nd triple of the year, a season high. Hit career home run #100 8/19 vs. SF…Rated by poll of Major League managers in Baseball America as the "Best Hit-and-Run Artist" (tied with M. Prado) and the"Best Defensive Catcher. "…Underwent surgery in September for a partially torn left thumb ligament. Required a second surgery on December 15. Voted as starting catcher for National League All-Star team but missed the game due to injury. It was his 6th straight season selected to the Mid-Summer Classic...Was the Cardinals Opening Day catcher for the 10th consecutive season. Homered for the Cardinals lone run in a 1-0 shutout win at Cincinnati on March 31...Missed 40 games (7/10-8/28) with a torn ligament in his right thumb that required surgery. Suffered the injury while sliding into 3rd base on 7/9 vs. PIT...His 110 games played were fewest since his debut season in 2004 (51 games)...Batted .287 with 7 HR and 30 RBI (83 games) prior to injury and .267 with 0 HR and 8 RBI following his return (27 games)...The Cardinals were 44-39 before his injury and 18-9 after he returned...Posted the longest Cardinals hitting streak of the season at 15 games (4/7-25), tied career best...Batted .344 (33-96) in April, ranking 7th in the National League...Threw out 20-of-43 attempted base stealers and led the Major Leagues in opponent stolen base percentage (53.5) with the next closest catcher at 63.8% (Chirinos, TEX)...Batted .240 with two strikes, ranking 13th in the N.L...Tallied two hits in the 8th inning vs. CHI (8/30 )...Picked off three runners (T3rd in MLB) and has 45 for his career, most among active catchers...Led all National League catchers with a .998 fielding pct. and was 2nd among all N.L. qualifying position players trailing only outfielder Will Venable (1.000)...Cardinals were 27-7 in games which he scored a run during the regular season; 6-1 in the games he homered...Played the entire National League Division Series and Game 1 of the National League Championship Series before a strained oblique injury during a 6th-inning at-bat of Game 2 sidelined him for the rest of the LCS...Batted .238 (5-21) with a double and two runs scored over six games...Hit safely in 4-of-6 games with a 2-for-4 effort in Game 3 of the NLDS in which he doubled and scored the eventual game-winning run on Kolten Wong's home run...Surpassed Albert Pujols to become the Cardinals all-time leader in postseason hits with 89 with a single in the bottom of the 2nd inning of Game 2 of the NLCS. Finished 3rd in National League MVP voting, receiving two 1st place votes... Won his sixth consecutive Rawlings Gold Glove award for his defensive excellence; committed just four errors with three passed balls during a season in which he led National League catchers in games (131) and innings caught (1115.1)... Won the Silver Slugger award, presented annually by Louisville Slugger to the best offensive player at each position in each league with voting conducted by Major League managers and coaches... Voted to the National League All-Star team and was the senior circuit's leading vote getter at 6,883,258; started at catcher and played 5.0 innings, going 0-for-2 at the plate... Had the best offensive year of his career, with a career high .319 avg., 161 hits, 68 runs, 44 doubles and 80 RBI; as well as extra-base hits (56), go-ahead RBI (19) and GW-RBI (10)... Led the Cardinals in batting (.319) for the 3rd consecutive season and ranked 6th in the National League. Also ranked among league leaders in doubles (44, 2nd), multi-hit games (50, T7th), three-hit games (14, T5th) and four-hit games (4, T3rd)... His 44 doubles set the Cardinals franchise record for doubles by a catcher, surpassing Ted Simmons mark of 40 set in 1978. They are the 2nd most in a single season in the majors by a catcher behind Ivan Rodriguez (47, 1996)... Tallied a career-best 161 hits, posting 100+ hits for the 6th consecutive season... Batted .373 with runners in scoring position (47-126), ranking 6th in the N.L... Was the 3rd-toughest player to strikeout in the N.L. with a strikeout every 14.50 plate appearances... Led MLB with a 57.8% stolen base percentage throwing out 20-of-46 attempted base stealers. Also led all N.L. catchers in games (131), innings caught (1115.1), total chances (1043) and putouts (976)... For the first time in his Major league career did not record a pickoff all season... Batted .394 (37-94) in May; his 37 hits in May were a career-high for a single month. Had 30 hits in April (30), May (37) and June (33). Hit 12 doubles in the month of June, T1st in the National League... Had a season high 11-game hitting streak 4/29-5/11 (.476)... Was placed on the 15-day DL on 7/31 with a right knee sprain and missed 14 games (8/15)... Caught every game and inning of the 2013 postseason...hit .274 (17-62) during the postseason with hits in 12 of the 17 games played...had two hits in Division Series Game 1 vs. Pittsburgh and his solo HR in Game 2 was the only run for St. Louis...had 2 hits and a walk in League Championship Series Game 1 vs. Los Angeles Dodgers; singled in Game 3...scored two runs with two hits and an RBI in LCS Game 6 vs. LAD...extended his World Series hitting streak to 7 games before going hitless in Game 5...had a single and his RBI groundout scored the Cards first run in World Series Game 2 at BOS...had three hits and reached four times (IBB) in Game 3, and had RBI with his single in the 1st inning...doubled in Game 4, his only extra base hit during the WS. Had the best offensive year of his career, becoming the first Cardinals catcher to lead the team in batting in back-to-back seasons (.315 in 2012, .305 in 2011) and finished 4th in the National League MVP voting. Ranked 4th in the National League in batting (.315), 10th in OBP (.373) and 14th in SLG(.501). Had career-highs with 22 HR, 76 RBI, 64 runs and 159 hits. His 22 HR's are 2nd only to Ted Simmons (26-1979) by a STL catcher in a single season. Ranked 2nd among NL catchers in HR (22), 3rd in BA(.315)& 3rd RBI (76). Tallied 100 hits (159)for the 5th consecutive season,ranking 2nd on the team behind Holliday (177). His 32 caught stealing topped MLB & he ranked 2nd in MLB with a 47.9 caught stealing percentage. Had three pickoffs which tied for first in the National League (2nd in MLB), and 42 career-the most among catchers from 2004-2012.Recorded 46 multi-hit games (T18th in the N.L.). Ranked 3rd on the team with 28 doubles. Led ML catchers with 12 SB's, becoming the 10th catcher with 10 SB in a season since 2004. The 12 steals were a Cardinals single-season record by a catcher. Had a pair of 2-SB games (5/1 vs.PIT&8/3 vs. MIL) giving him three for his career. Played his 1000th career game on 6/12 vs. Chicago White Sox & collected his 1,000th career hit on infield single 9/4 vs. NYM. Was voted by MLB players as N.L. All-Star, but was on the bereavement list 7/6-8 and missed the All-Star game. Had a season-best 11-game hit streak from 7/25-8/7 (.413 BA). Batted .403 (3rd NL)in August & was 3rd in OBP (.453). Hit at a .380 clip on the first pitch (41-108) with 7 HR. The 7 HR's ranked T7th in the National League and T13th in MLB. Hit his 3rd career grand slam on 5/27 vs.PHI(R. Halladay).2012 POSTSEASON: Batted .393 (11-28)in the NLCS with two RBI including a 4-for-4 performance in Game 7...hit .265 (13-49) over the entire postseason with four RBI...hit safely in 6-of-7 LCS games and recorded exactly four at-bats in each game...was flawless in 107 total chances defensively...his five walks in the NLDS vs. WSH were T1st in DS with Beltran, Kozma and Teixeira (NYY). Had the best offensive year of his career, leading the team in batting at .305, which ranked 8th among all National Leaguers...Is the first player other than Pujols to lead the team in batting since before Pujols' rookie year (2001). [Holliday & Pujols tiedfor team lead at .312 in 2010.] He was the first catcher to lead the Cardinals in BA since Ted Simmons (.310) in 1973...Earned the Rawlings Gold Glove at catcher, his fourth-straight such honor. He was also voted the recipient of RawlingsPlatinum Glove award. Led all Major League catchers with 137 games played and 131 starts. Had two pickoffs this season toup his career total to 39...Was selected to his 3rd consecutive All-Star game; caught 4.0 innings and doubled in his lone at-bat after coming into thegame as a substitution for starter Brian McCann...Played in 139 regular season games, second most of his career (140, 2009)...Ranked 1st among N.L. catchers in BA (.307) and hits (145), 2nd in 2B's (32) and 3rd in RBI (65)...Tallied 100 hits (145) for the 4th consecutive season, ranking 3rd on the team behind Pujols and Berkman...Set a career high with 14 home runs and 65 RBI, becoming first St. Louis catcher with 14+ HRs since Eli Marrero (18, 2002)...His .337 BA (68-202) after the All-Star Break was T7th in N.L...Had 39 multi-hit games and 13 multi-RBI games. Had multiple hits in four consecutive games 5/15-18 and back-to-back 3-hitgames 5/17-18...Led all N.L. catchers with 12 3-hit+ games, that included two 4-hit games. Had four hits on 5/22 at KC that included double,triple and 3 RBI...HRed in three consecutive games 7/22-25 for the secnd time in his career (6/24-26/05). Had a 14 game hit streak (22-54,.407) from 7/21-8/11, one game shy fo his career high...Was crucial down the stretch for St. Louis, hitting .342 in August and .341 in September...Missed five games for MLB suspension, served 8/4-9, after his ejection on 8/3 at MIL...Walked three times and doubled at HOU on 9/26, it was his career-high 32nd double, the 5th Cardinals catcher since 1900with 30 doubles and first since 1980 (Ted Simmons)...2011 POSTSEASON - Started all 18 games and played every inning during the club's 2011 playoff run (includes 1.0 inning atfirst)...became the first Cardinals catcher to appear in the postseason five different seasons (2004-06, 09, 11)...caught five base runners,two in the Division Series and three during the World Series vs. three stolen bases (2 DS, 1 WS)...hit .299 and had five doubles and12 RBI during the playoffs...singled in four of five Division Series games vs. Philadelphia, and had a caught stealing at 2nd in 6th ofGame 5...hit .333 during the League Championship Series vs. Milwaukee...was 3-4 in Game 5 that sent the series back to Milwaukeeand over the final two games of the LCS (Games 5 & 6) was 5-8...during theWorld Series batted .333...had two doubles inWS Game3 with 4 RBI and had three hits in Game 5...picked up 2 RBI in both Games 6 and 7...his 9 RBI in WS were most by a catcher in WSsince Sandy Alomar, Jr. (CLE) had 10 in 1997...his 20 hits were most by catcher in postseason since I. Rodriguez had 21 in 2003. Played in 136 games, batting .262 with 6 HR and a career best 62 RBI. His 122 hits ranked 2nd among NL catchers (McCann, 123)...Was voted as the starting catcher for the National League All-Star team for the second consecutive season. Went 1-for-1 with a single and caught four innings...Missed final 12 games of the season with a sore right knee, but still led all MLB catchers in innings played (1138.0), games started (130) and assists (79)...Led all NL catchers with 465 at-bats and eight stolen bases...Led the NL in RBI with bases loaded (24), batting .533 (8-15), T4th in NL...Tied for second in the National League with two grand slams. Hit his first professional grand slam on Opening Day (4/5 at CIN) joining Mark McGwire and Scott Rolen as only Cardinals with a grand slam on Opening Day. Was one of three MLB players with two grand slams on the road in 2010...Finished 2nd in MLB to Yorvit Torrealba in catcher's ERA (3.23)...Led all MLB catchers throwing out 44.4% (28 CS-63 ATT) base stealers, his fourth NL title in that category in seven ML seasons...Ranked 4th in the NL in hardest to fan (10.2 SO/AB) striking out just 51 times in 465 AB...Had a career high five RBI and career-tying four hits 9/17 vs. SD with two doubles and two singles...Ranked first in the Majors with a .455 batting average (10-22) on 0-2 counts...Batted .315 (63-200) following the All-Star break, 4th among MLB catchers. Hit .223 prior to the break...Cardinals were 6-0 in games in which Molina homered, and they have won eight straight games in which he's hit HR. Picked up his second-straight Rawlings Gold Glove Award. Was named to the Sporting News N.L. All-Star team, as voted onby players...Garnered All-Star honors for the first time, voted as the starting catcher for the N.L. Caught 8.0 innings while also deliveringan RBI-single...Led the majors in games started (136), the most by a Cardinals catcher since Ted Simmons (139) in 1977. Caught 1176.2innings, 2nd-most in MLB trailing only LA's Russell Martin (1201.0)...Led the majors with eight pickoffs, uping his career total to 34...The Cardinals were 27-12 in his multi-hit games, including a 7-1 record when he had three or more hits...Had a career-high 9 steals, matching STL single-season record for catcher (Marrero-'99, Pagnozzi-'91 & McCarver-'66). His 9 steals were 2nd among ML catchers to LA's Martin (11)...Struck out once every 13.9 PA's - 2nd-lowest in N.L. Had his best season at the plate to go along with his consistent and solid defensive play...Was named to Rawlings Gold Glove team for the first time, the 3rd STL catcher to ever win the award (Matheny, Pagnozzi).Led MLB with seven pick-offs...Set career highs in batting avg., runs, RBI, OBP and SLG...Improved his batting average by 29 pts. (.275 - .304) after a 59 pt. increase from 2006 to 2007...His 135 hits were the most by a STL catcher since Ted Simmons had 150 in 1980. Was also the first Cards catcher sinceSimmons in 1980 to post a batting average of .300 or better (min. 450 plate apps. )...His .304 batting average as a ctacher was 4th-best all-time among STL catchers (min. 450 PA's). Is only STL catcher otherthan Simmons to have a BA over.300 as a catcher and have over 450 plate appearances (Simmons in 1975, '77 and '80)...His 135 hits ranked 24th on the Cards all-time catcher's list...Suffered bruised left thigh in collision at plate with Cubs' T. Lilly on 9/10 and did not return to lineup until 9/14. Left that gameafter 4th inning at-bat due to a tight quad and did not return to the lineup the rest of the season. Pinch hit the last day of theseason (9/28)...Led team and ranked 6th in the N.L. with a .340 (34-100) batting average with runners in scoring position...Hit safely in 94 of his 116 games started...Averaged 16.7 plate appearances/ strikeout (485 PA/ 29 K)...His 28 total strikeouts as a catcher were the fewest by a STL backstop (min. 450 PA's) since Ted Simmons fanned just 20times in 1976. Strikeout total was the second fewest by a MLB backstop since 1993 (A.J. Pierzynski 26K's for SF in 2004)(min. 450 PA's)...Had hits in 64 of his last 78 games played since 5/28 (.317, 91-287)...Had 31 multi-hit games and 33 of his 56 RBI came with two outs...Batted .400 (10-25) in eight Interleague games. Batted .408 (20-49) in 13 games vs. PIT and combined to bat .347 (41-118) in33 games vs. N.L. East teams...Had a pair of 13-game hitting streaks, his season high. First was from 6/20-7/6 (.362, 17-47) with the second from 8/16-9/2(.380, 19-50)...Had a pair of 13-game hitting streaks, his season high. First was from 6/20-7/6 (.362, 17-47) with the second from 8/16-9/2(.380, 19-50)...Made his fourth straight Opening Day start for the Cardinals on 4/1. The last Cardinals catcher to do so was Darrell Porter (5-straight; 1981-85)...Opened season with 7-game hitting streak from 4/1-9 (.308, 8-26) - the longest STL hit streak to begin a season since 2003...His HR on 4/1 was 1st by STL catcher on Opening Day since Mike DiFelice in 2002...Removed from field on stretcher after home-plate collision in the 9th, 6/15 vs. PHI - held on to the ball after tag to help STL towin. Suffered a concussion and missed three games...Was DH 6/20 at BOS in his first game since collision and hit solo HR that secured winning margin in 5-4 win. Made 1st careerstart at 1B 6/22 at BOS...Matched career high with 4 hits & 4 RBI on 8/22 vs. ATL. Posted career-highs with .275 BA & 97 hits while continuing to supply game-changing ability with his defense. Caught 23 of 46 (50%) opponents attempting to steal, tops in the majors. He leads all Major League catchers in throwing pct. (47%) and pick-offs (18) since 2005. Missed most of the month of June with a non-displaced fracture in his left wrist. His season ended a week early as he had surgery on his right knee on 9/24. Had career-high 15 game hit-streak (.373 BA) from 5/1-24. The streak was longest by a Cards catcher since 1993 (ErikPappas: 16-games, 5/14-6/5). His hits during the streak came in his first AB of the game in 7 of the 15 games. Had 12 multi-hit games in his last 35 starts (8/9-9/30). He batted .310 (49-158) in last 50 games with an AB & ranked 5th among NL catchers in BA since ASB (.281). Led all Cardinals regulars with a .400 batting average (18-for-45) in Spring Training Had pair of hits in his third Opening Day start on 4/1, batting out of the five-spot in the order for first time. Had 3 hits & 3 RBI 4/8 at HOU and collected three hits 4/27 vs. CHI, including a 2-run HR (#1) in the 7th. Suffered a fracture of his left wrist on 5/29 at COL. Came out of the game in the middle of the 4th with the injury that occurredwhen he took a foul tip off his wrist in the third inning during M. Holliday's at-bat. Was activated from the disabled list on 6/28 after missing 26 games. Committed the first multi-error game of his career 7/13 at PHI (throwing, catching). Doubled 7/14 at PHI for first extra-base hit since 5/24. Had season high 3 hits (2-2B's) 8/2 vs. PIT. Had 2nd-straight multi-hit game (2-4) 8/3 at WSH and drove in the tying run in 8th. Also had 3-hit games 8/9-10 & had four 3-hit games in span of 11 starts (8/2-16). Had first career multi-HR game 8/16 at MIL, going 3-for-3 with BB, 3 runs & 3 RBI. Homered and had go-ahead double in 8/22 win vs. FLA. Homered in back-to-back starts 8/31-9/1. Caught both games & all 18 innings of 9/15 DH vs. CHI. Had key 2-run 2B in Game 2 win. Had 3 hits on 9/19 vs. PHI, including GWRBI in 10th on Yadier Molina Bobblehead night. Underwent a medial menisectomy on his right knee on 9/24 by team physician, Dr. George Paletta. Signed a 4-year contract extension with club option for 2012 on January 21 at Cardinals Winter Warm-up weekend. Displayed outstanding defense throughout the year in just his second season as the Cardinals starting catcher and providedplenty of thrilling moments with his stand out performance during the postseason...Young catcher had seven pickoffs on the season and he leads the majors with 16 over the past two seasons...Went 26-for-63 (41%) on opponent stolen base attempts for the year and led NL catchers with his 79 assists...Recorded 23 two-out RBI and was 3rd on team with 26 doubles...Snapped an 0-for-11 skid with infield single 9/25 vs. SD...Things came in pairs 9/19 at MIL; 2 hits, 2 runs, 2 BB & 2 RBI ...also had his first steal of the year...Had a 12-game road hitting streak (.357; 15-42, 3-HR & 7 RBI) that ended on 9/7...Matched a career high with 4 RBI 8/7 at CIN, thanks to 2-run HR and 2-run 2B that each came with two outs...Had 4th 3-hit game & matched a then season-high with 3 RBI on 7/16 vs. LA. Had three doubles in two games 7/15-16 vs. LA...Went 3-for-4 with two doubles & 3 RBI 6/23 at DET. Matched career-high with 4 hits on 6/2 vs. Chicago...HRed 6/11 at MIL, his 2nd HR in 5-game span...Matched career-best hitting streak with 7-gamer that was snapped 6/6 (11-for-30, .367, HR, 5 RBI)...Tied 5/30 game vs. HOU at 1-1 in the 2nd inning with RBI double & doubled in the 11th on 5/31 & scored winning run...Hisdouble on 5/30 was 1st extra base hit since 5/9...Picked Brian Giles off of first base to end the game on 5/28 at SD...it had been almost four years since a major league gameended with a catcher's pickoff...Ivan Rodriguez (TEX) picked off R. Hidalgo (HOU) on 6/14/02 to secure a 9-6 win for theRangers...Took part in postseason play for third straight season and led the team with 19 hits, 29 total bases, .358 BAand was second with 8 RBI in his 16 games played...started all 16 games behind the plate and made just one error as Cardinals pitcherscombined for a stellar 2.68 ERA...was one of several NLCS Game 7 heroes for St. Louis, delivering a 2-run HR in the 9th inning offAaron Heilman to give Cardinals a 3-1 lead...had hits in all but four postseason games...batted .412 (7-17) in World Series, while hittingsafely in all five games...had three hits and two runs in Series clinching Game 5 win...drove in a run with a double in Game 4 of theWS and walked twice...doubled in WS Game 3...had two hits in LCS Game 4, including solo HR...recorded three hits and drove intwo runs in LCS Game 2...singled in his first AB of the LCS in Game 1...had an RBI single in DS Game 1 at SD...picked off Mike Piazzaat first to end Padres 1st inning in DS Game 3...had two hits in DS Game 4. Shut down opponent's running games, throwing out 17 of 31 runners attempting to steal (55%). Also picked off nine runners...Allowed fewest SB's (14) among ML catchers (min. 100 games started). Twins' Joe Mauer was next closest with 31 allowed...At 22 years of age, became the youngest catcher to start for an N.L. club on Opening Day since Jason Kendall did so for thePirates at the age of 21 in 1996...His eight home runs were the most by a St. Louis catcher since Mike Matheny also had eight in 2003...Became just the fifth Cards catcher to homer in three-straight games, doing so vs. PIT 6/24-26, capped by a two-run shot on 6/26...Itwas the first time since 1994 (T. Pagnozzi) that a Cardinals catcher had three-straight games with a home run...Batted .299 (50-for-167) in May and June combined after starting the season hitting .162 in April...Missed 33 games from 7/8-8/17 due to HBP on the left hand on 7/7 at ARI that caused hairline fracture to his 5th metacarpel...After returning from the DL batted .467 (14-for-30) with RISP and .500 (9-for-18) from 9/1 to end-of-season...Had a three-hit game on 4/18 and two-hit game 4/19, as he broke out of an early season slump...Collected a pair of hits on 4/30 at ATL, including a run-scoring double in the 2nd inning. Followed that up with 2-hit game 5/1 at CIN...Had two singles 5/8 vs. SD before spraining his left ankle in the 7th on the bag at first. Started on 5/12 vs. LA after missing threegames with his sprained ankle and went 3-for-4 with an RBI...Had game-winning single in the 12th on 5/24 vs. PIT- his second career walk-off game-winning hit...Had career-high four hits (including two doubles) and four RBI in 5/25 win vs. PIT...Ended a career high seven-game hitting streak 6/28 (11-for-24, .458, 3 HR)...Scored twice in 8/28 win at WSH, had GW-RBI and stole two bases - his first stolen bases of his career...Had RBI in four-straight games 8/31-9/4 (seven total), including three two-RBI efforts...It was his second RBI streak of four games induration, he also did so from 6/23-26...Caught the duration of all nine postseason games for the Cardinals, helping St. Louis pitchers to a 3.19 ERA...drove in three runs while batting .286...SD stole two bases in Game 1 of the Division Series before Molina shut down the Padres running the game the rest of the series...had two hits and drove in two in Game 3 of the DS vs. SD...collected two hits in Games 2, 3 and 5 of the League Championship Series vs. HOU...allowed only one HOU stolen base in the series. Rookie catcher made a healthy impression in his first year in the Majors...Threw out 50% of would be base thiefs (8-16) in 51 games played (39 starts)...Caught 344.0 innings allowing 139 earned runs for a 3.64 catcher's ERA. Caught shutouts in three of his starts...Began the season at Triple-A Memphis where he batted .310 (39-126) with a HR and 14 RBI in 36 games...With Memphis threw out 17-28 (61%) runners attempting to steal and batted .444 (8-18) with RISP...Contract was purchased from Memphis on 6/3 to replace injured Mike Matheny...Made major league debut on 6/3 at PIT and went 2-4, with double and run scored. Was involved with a play at the plate in the 2nd inning, recording the out when A. Nunez tried to score from second on a single to right, and threw out J. Wilson attempting to steal in the 8th...First ML hit was a single to left off PIT's O. Perez in 5th inninig on 6/3. Collected first ML RBI on 6/5 vs. HOU with single...Drove in two runs with a single 6/13 at TEX and threw out baserunner...Had first career three-hit game on 6/25 at KC...Had a key two-run, two-out single in 7/25 win vs. SF and matched career high with three hits on 7/27 at CIN...Had first career GWRBI with bases loaded single in the 9th on 8/7 vs. NY...Made two terrific putouts at the plate on 8/28 at PIT, including a violent collision with Ty Wigginton...Belted his first Major League homer 9/23 at MIL and went 2-3 with 2 RBI...his HR snapped a 2-2 tie...Had a 2-run double in the 9th inning of 9/25 win at COL...Had GWRBI 10/1 vs. MIL going 1-3 with a 2B. Was 2-2 with his second home run of the year and an RBI single vs. MIL the last day of the season, 10/3...Did not see action in the Cardinals' Division Series round, but did start and catch Game 4 of the LCS vs. HOU...was 1-4 in the team's 6-5 loss...appeared in three World Series games vs. BOS, including a start in Game 4...was 0-1 as a pinch hitter in Game 1 and caught the 9th inning of Game 3. Played at Tennessee (AA) where he caught 100 games for the Smokies, helping the club to the semifinals of the Southern League...Started and finished the year strong. Hit .304 in 19 games in April and in 27 games during August he hit .362 with 15 RBI...Ranked fourth in the league by throwing out 38 of 94 base runners (40.4%)...Batted .312 on the road and .342 against lefthanders compared to .234 at home and .257 against righties...He struck out just 45 times in 364 at-bats, the fifth-best ratio in the league...Amassed two nine-game hitting streaks and one 13-game hitting streak during the year. Hit in nine straight from 4/22-5/3 and 5/23-6/3...His longest streak came in August where he hit .457 (21-for-46) from 8/9-8/23...Recorded four hits on 8/14 at Orlando, scoring three times...Had a season-high four RBI twice, 6/1 at Jacksonville and 7/19 at Birmingham. Was the regular backstop for the Midwest League Champion Peoria Chiefs (A), appearing in 112 games behind the plate...led Midwest League catchers in assists (140) and double plays (9) while posting a .985 fielding pct...also helped the Chiefs' pitching staff to a league-leading 2.78 ERA...threw out a whopping 52 pct. of opposing base-stealers...he fanned just 36 times in 393 at-bats, the 2nd-best ratio in the league. Was drafted by the Cardinals in the fourth round of the June 2000 draft and signed his first professional contract on 9/6/00...began his pro career at Johnson City (R) of the Appalachian League where he appeared in 44 games...recorded 81 assists in just 42 games at catcher. June 5, 2018 St. Louis Cardinals activated C Yadier Molina from the 10-day injured list. June 2, 2018 St. Louis Cardinals sent C Yadier Molina on a rehab assignment to Springfield Cardinals. May 6, 2018 St. Louis Cardinals placed C Yadier Molina on the 10-day disabled list. Pelvic injury with traumatic hematoma. 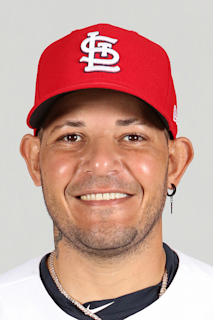 April 12, 2018 St. Louis Cardinals activated C Yadier Molina. April 11, 2018 C Yadier Molina roster status changed by St. Louis Cardinals. October 14, 2016 C Yadier Molina assigned to Gigantes de Carolina. August 29, 2014 St. Louis Cardinals activated C Yadier Molina from the 15-day disabled list. August 27, 2014 St. Louis Cardinals sent C Yadier Molina on a rehab assignment to Springfield Cardinals. July 10, 2014 St. Louis Cardinals placed C Yadier Molina on the 15-day disabled list. Torn ligament in right thumb. August 15, 2013 St. Louis Cardinals activated C Yadier Molina from the 15-day disabled list. July 31, 2013 St. Louis Cardinals placed C Yadier Molina on the 15-day disabled list. Right knee sprain. July 13, 2012 St. Louis Cardinals activated C Yadier Molina from the bereavement list. July 6, 2012 St. Louis Cardinals placed C Yadier Molina on the bereavement list. August 10, 2011 St. Louis Cardinals activated C Yadier Molina. August 4, 2011 C Yadier Molina suspended. October 22, 2010 DH Yadier Molina assigned to Gigantes de Carolina.